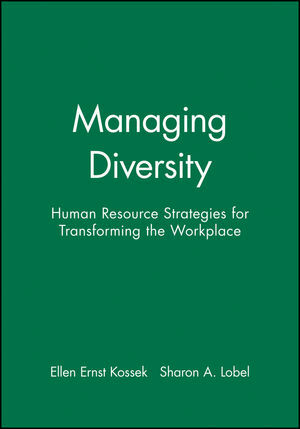 Managing Diversity is the first book to examine in detail how specific human resource functions need to be modified to support workforce diversity. Ellen E. Kossek is Associate Professor of Human Resource Management and Organizational Behavior at the School of Labor and Industrial Relations, Michigan State University. She has worked on HR for many companies on both the USA and Japan, and she has published extensively on human resource management and diversity issues. Sharon A. Lobel is Associate Professor of Management at Seattle University. Her research on the many aspects of managing diversity on organizations and has appeared in numerous journals. Part I: Recruiting and Selecting a Diverse Workforce:. 1. EEO Law and Managing Diversity: Elaine K. Yakura. 2. The Implications of a Diverse Labor Market on Human Resource Planning: Richard D. Arvey, Ross E. Azevedo, Daniel Ostgaard and Sumita Raghuram. 3. Diversity Considerations in Staffing Decision Making: Robert L. Heneman, Nancy E. Waldeck and M. Cushnie. Part II: Developing and Motivating a Changing Workforce:. 4. Mentoring in a Context of Diversity and Turbulence: Kathy E. Kram and Douglas T. Hall. 5. Performance Appraisal and Demographic Diversity: Issues Regarding Appraisals, Appraisers, and Appraising: Chao C. Chen and Nancy DiTomaso. 6. The Role of Training in a Changing Workforce: New Perspectives and Approaches: J. Kevin Ford and Sandra Fisher. 7. Compensation and Diversity: New Pay for a New Workforce? : Alison E. Barber and Christina L. Daly. Part III: Innovations in Diversity Management:. 8. Human Resource Strategies to Support Diversity in Work and Personal Lifestyles: Sharon A. Lobel and Ellen Ernst Kossek. 9. Unions, Collective Bargaining and the Diversity Paradox: John T. Delaney and M. Catherine Lundy. 10. Workplace Health and Safety: Implications for Diversity: Karen A. Brown. 11. Managing Disability-Based Diversity: Karen Roberts. Part IV: Linking Diversity to Organizational Strategy:. 12. Managing Diversity within Multinational Firms for Competitive Advantage: Gary W. Florkowski. 13. Diversity: A Strategic Issue: Parshotam Dass and Barbara Parker. 14. Capitalizing on the Benefits of Diversity through Work Teams: Donna Thompson and Laura E. Gooler. Part V: Managing Diversity and Organizational Development: Original Cases and Lessons from the Field:. 15. Personal Reflections on the Diversity-Management-Organizational Development Marriage: Roosevelt Thomas. 16. To Do or Not to Do: Initiating Diversity Programs: Everette J. Freeman. 17. Managing Diversity as a Vehicle for Culture Change: Ellen Ernst Kossek. 18. Functional Diversity at Work: A Client Driven Case for Managing Diversity: Toni A. Gregory and Ronald P. Lewis. 19. Crossing Borders: Bernardo M. Ferdman and Placida I. Gallegos. 20. Adapting Human Resource Systems to Manage Global Diversity: Ellen Ernst Kossek. Includes groundbreaking chapters on work/life and diversity, disability and diversity, health and safety and diversity, and unions and diversity.